This Beef Lo Mein home-cooked version tastes awesome, is easy to make, uses more vegetables and less oil than takeout. 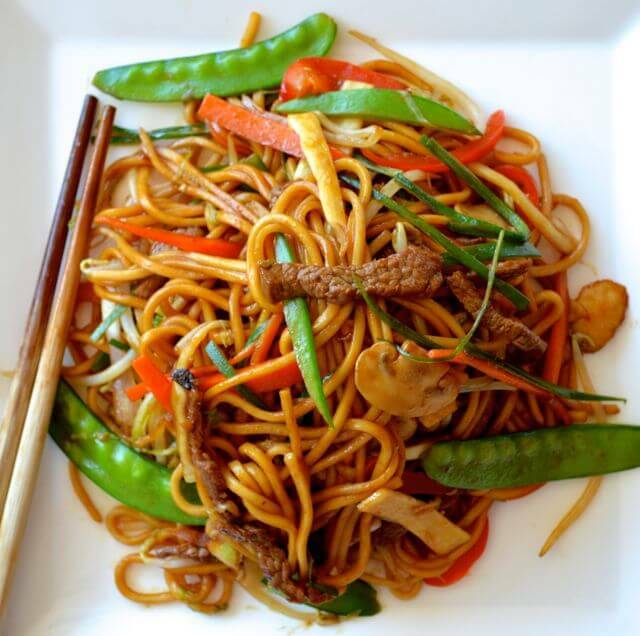 It's a must-try beef lo mein recipe! Slice the beef into thin 2-3 inch strips and mix well in a bowl with corn starch, 1 teaspoon soy sauce, and oil. Set aside. If using white noodles, boil them in about 2 quarts of water, rinse in cold water and drain. If using lo mein egg noodles, you can skip this step. If you can't get lo mein or other fresh noodles at your Asian grocer, fresh or dried linguini pasta will do also. Cut your veggies and have them all ready for cooking. Heat the wok until smoking slightly and add a couple tablespoons oil to coat the wok and sear the beef. Take the beef out of the pan and set aside. Add the garlic and all the vegetables to the pan except the dark green parts of the scallion, bean sprouts and the snow peas. Stir-fry on high heat for a minute and add the wine in a circle around the perimeter of the wok. Add the noodles and beef back to the pan and mix well from the bottom up for about 30 seconds. Then cover the wok for one minute. Remove cover and add the remaining tablespoon of regular soy sauce, the dark soy sauce, sesame oil, salt, sugar, dark green parts of the scallion, bean sprouts and snow peas. Mix well and stir-fry for another minute, or until any remaining liquid has evaporated. Plate and serve!